MadgeTech is proudly known across the globe as the industry expert and leading manufacturer of data loggers available today. All MadgeTech data loggers are designed and manufactured in the USA by our world-class engineering and production teams. 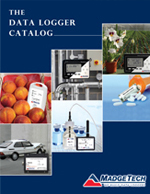 Our pressure, humidity, and temperature data loggers are used to measure and record data for a wide variety of applications in many industries including food, pharmaceuticals, energy and more.